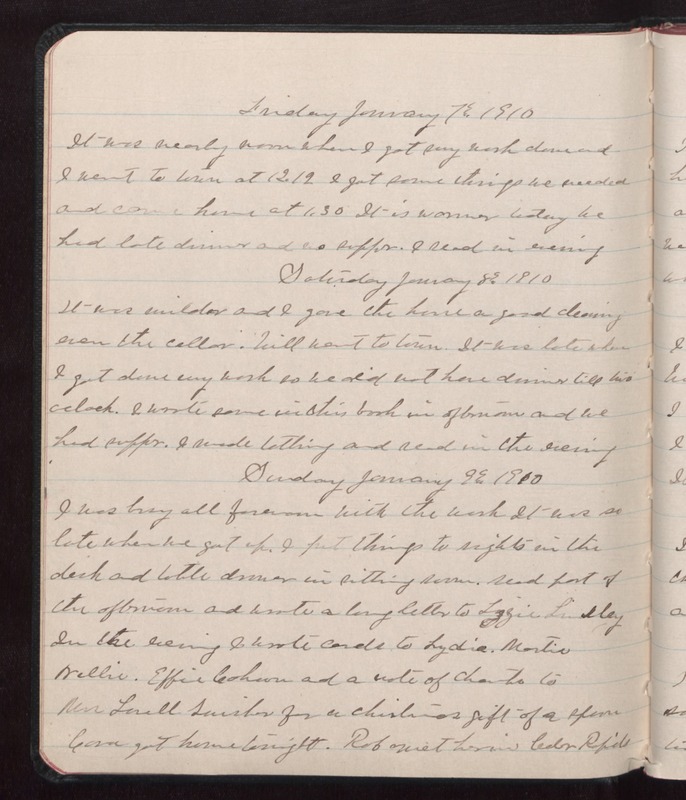 Friday January 7 1910 It was nearly noon when I got my wash done and I went to town at 12.12 I got some things we needed and came home at 1.30 It is warmer today we had late dinner and no supper. I read in the evening Saturday January 8 1910 It was milder and I gave the house a good cleaning even the cellar. Will went to town. It was late when I got done my wash so we did not have dinner till two oclock. I wrote some in this book in afternoon and we had supper. I made tatting and read in the evening Sunday January 9 1910 I was busy all forenoon with the wash It was so late when we got up. I put things to rights in the desk and table drawer in sitting room. Read part of the afternoon and wrote a long letter to Lizzie Lindley In the evening I wrote cards to Lydia, Martin Nellie. Effie Cahoun and a note of thanks to Miss [Lovell Swisher?] for a Christmas gift of a spoon]. Cora got home tonight. Rob met her in Cedar Rapids.